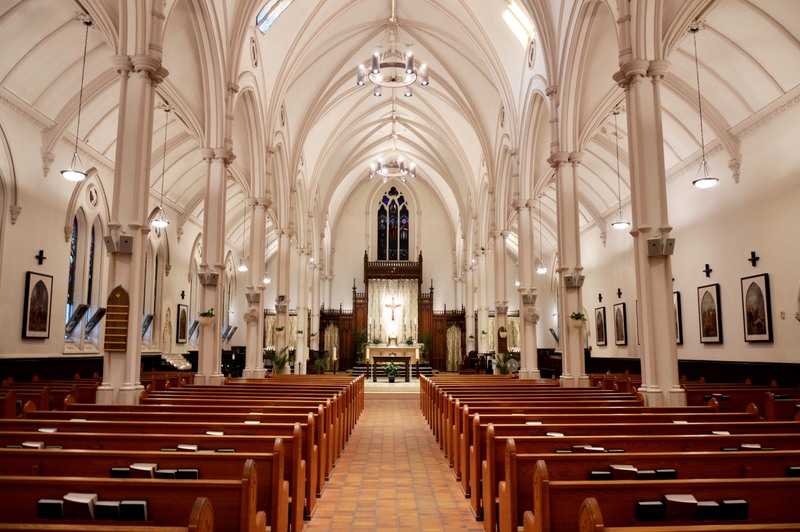 What will I see when I enter a Catholic Church? Sometimes being in a church can feel intimidating. We may not know how to act, what we can touch, or how to ask questions without feeling disrespectful. The following information is your etiquette guide and ‘cheat-sheet’ for things you’ll need to know when entering a Catholic Church. Feel free to add to this list as our program continues, and especially during our teaching Masses and St. Basil’s Parish historical tour, when your own thoughts or questions may arise. 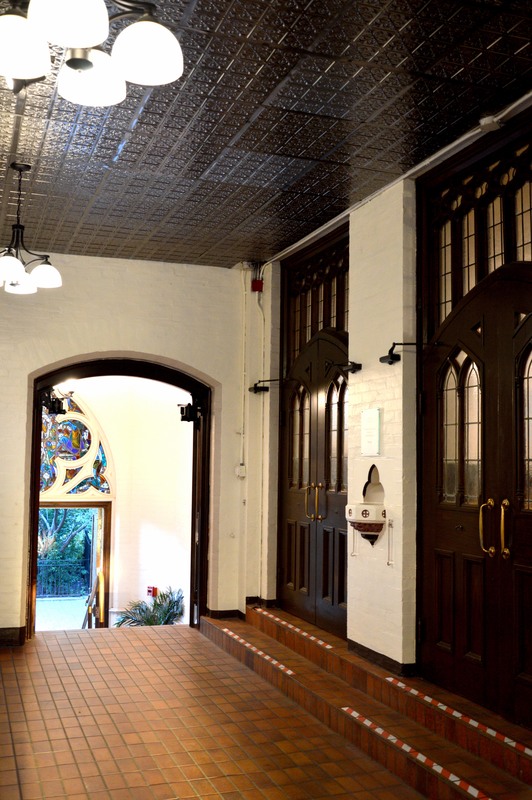 Everyone enters a church through the foyer (also known as a Vestibule). You’ll see pews in the vestibule as well as information brochures about our ministries. You’ll also see our Pastor, Fr. Chris, greeting parishioners in the vestibule every Sunday before and after Mass. Moreover, on the wall separating the vestibule from the church proper, you will find a holy water font. You will also see the baptismal font in the centre of the middle aisle when you first enter the church proper. 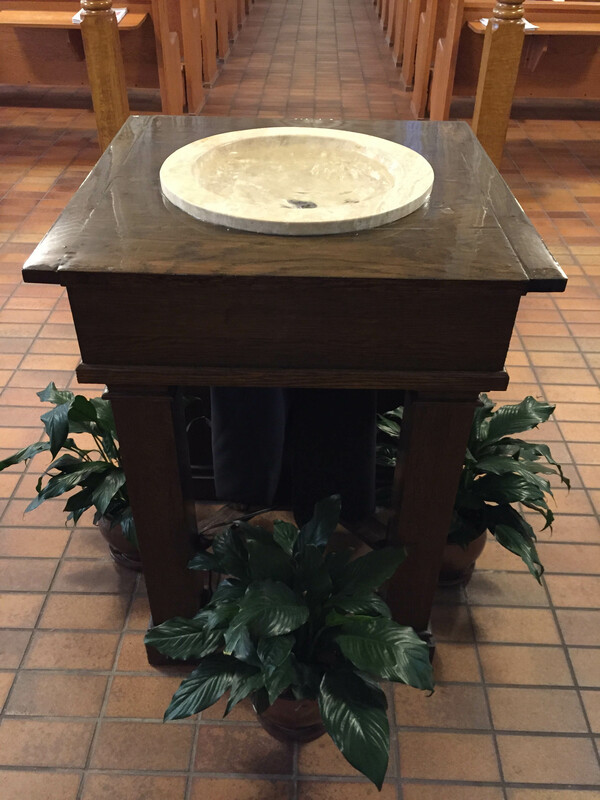 You may see a regular parishioner dip their fingers into either the holy water or baptismal font followed by them making the sign of the cross. These gestures are performed so that the parishioners may bless themselves either before or after Mass. This action also helps remind people that they are entering a sacred space and allows them to recall part of an ancient purification ritual of cleansing themselves prior to prayer and reception of the Eucharist. It also serves as a reminder of one’s baptism. Next, you will see the nave of the church. In this space (the largest of the church structure), you will find many pews and kneelers, which are arranged in rows. You do not need to be completely silent when entering a church, however, if you wish to carry on a conversation, it is suggested that you do so in the vestibule. Once you enter the nave, you are entering an area that is meant to be conducive to prayer and personal meditation/devotion. Look around you and take in the beautiful aesthetic and stained glass windows of St. Basil’s Parish. The windows recall great saints in the Catholic tradition and their contribution or patronage is written on a plaque directly below the window. Please feel free to walk around the nave and look at these stained glass windows/plaques in closer detail. 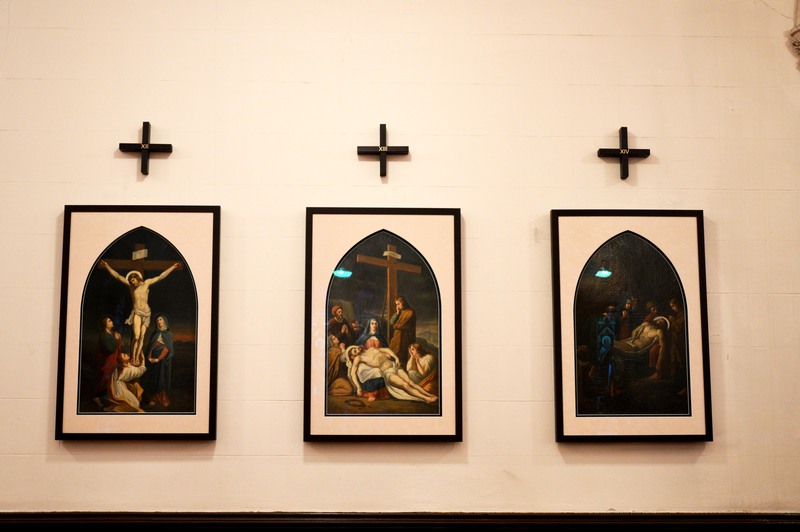 You will also notice fourteen Stations of the Cross on the walls in the nave. These images illustrate the passion and death narrative of Jesus Christ. Walk around and take a closer look at these paintings. Furthermore, you will see a statue of the Pieta on the right hand side of the nave if facing the altar (Mother Mary cradling her son, Jesus, after he was taken down from the cross) and the Sacred Heart of Jesus on the nave’s left hand side. Finally, in the back of the nave at St. Basil’s, you will see our Confessional. This can be a very mysterious aspect of any church. It may seem like a dark place with many negative connotations, but simply put, it is a place where one goes to confess their sins and receive forgiveness. The Sacrament of Reconciliation provides confessants (those who go to confess their sins) with immense healing and an encounter with a compassionate Christ. 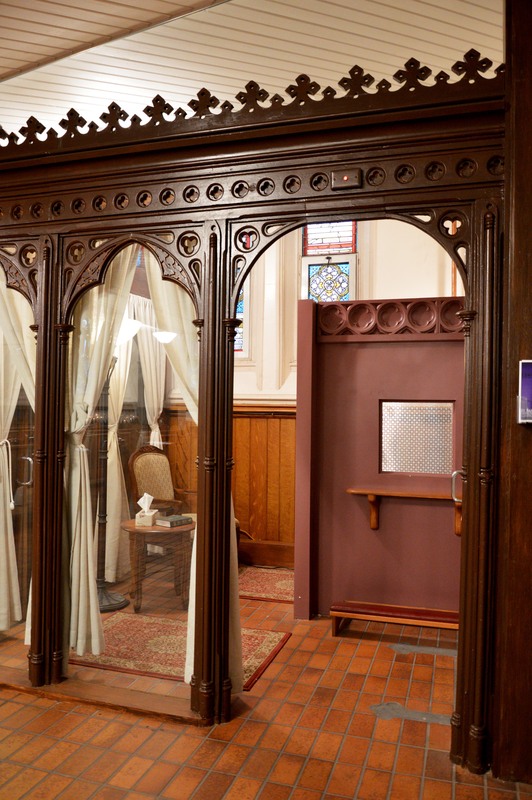 Here at St. Basil’s our confessional was completely remodelled in time for Easter 2014 using the wood of centuries-old confessionals that have heard the pain- and mercy- of years worth of confessions. When it is not in use, you are welcome to take a look inside- you will find that it is well lit, sound proof, complete with comfortable chairs, and you have the option of kneeling before a screen covering your face or sitting face-to-face with a priest. We will spend an entire class demystifying this Sacrament and you can ask as many questions as you like! Now we move to north part of the nave where you walk up two steps. Now you’re in the “sanctuary.” This part is exactly what it means: a sanctuary in which you are most closely in the presence of God since blessed hosts are reserved in a golden box on the high altar known as the “tabernacle.” The tabernacle contained blessed hosts (communion wafers) that are used during communion or taken to sick members of our parish community who are homebound and unable to attend Mass physically. The tabernacle is always locked so as to maintain the safety of and reverence for the blessed hosts contained within. The celebration of Mass occurs in the sanctuary, specifically on the altar (a wooden table). Where do you sit and entertain friends who come over for a dinner party? Exactly. An altar is meant to re-enact table fellowship. We come to Mass to be nourished by a meal. It won’t be a filling kind of meal in the literal sense, but in a profound spiritual way, the bread blessed and broken on that table will give us the energy we need for the week ahead. 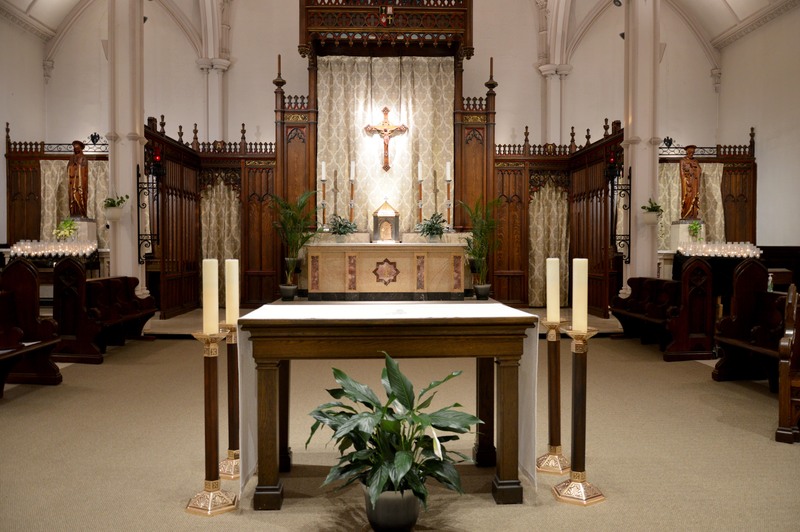 It is important to note, that the altar is unadorned when not in use, but everything, including the ambo (the place where the readings are read from during Mass), the cantor’s stand (where the cantor sings the parts of the Mass), and the presider’s chair (where the priest sits) are all left in place ready for the next celebration of holy Mass. 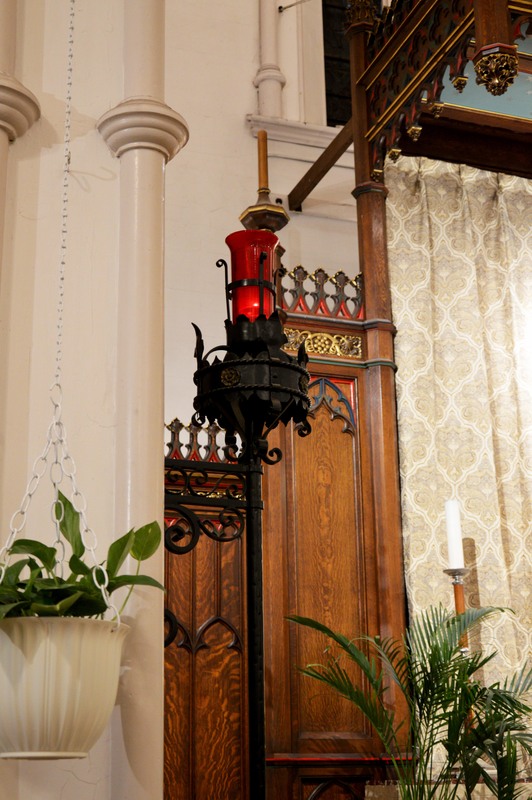 A sanctuary lamp is an oil-burning candle covered by red glass that is visible within the sactuary. This lamp indicates that consecrated hosts are present in the sactuary. A Catholic shows reverence for Christ’s presence in blessed hosts by genuflecting (bowing or kneeling) before the tabernacle. We do not reverence the altar, rather we are paying our respects to the tabernacle, which houses the real presence of Christ before we sit down for Mass or enter the church for personal prayer. Additionally, on our tour, you may hear the word “Sacristy.” This is a special room located within the parish offices at St. Basil’s that serves as a preparation room for all liturgical celebrations. Translated as “holy place,” the sacristy houses liturgical vestments, sacred vessels, books used during Mass, and a small sink called a “sacrarium,” which has plumbing that goes directly into the ground. This is important because a sacrarium allows us to wash vessels after Mass or properly dispose of a blessed host that is unable to be consumed (possibly because of contamination). Lastly, if you face south in the nave and look upwards, you will see our organ loft. Music plays a vital role in the celebration of Mass and liturgical gatherings. 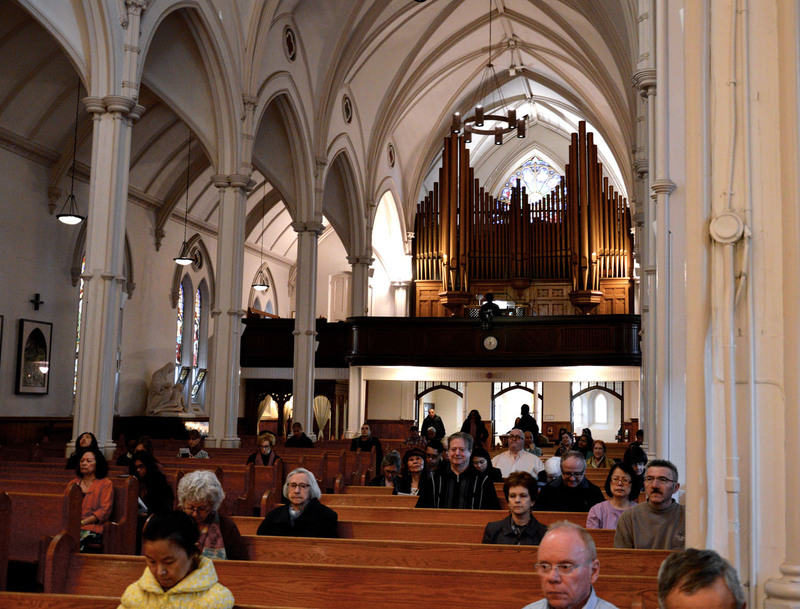 You will learn more about the significance of our pipe organ, built and designed in Quebec in 1919, during our tour.